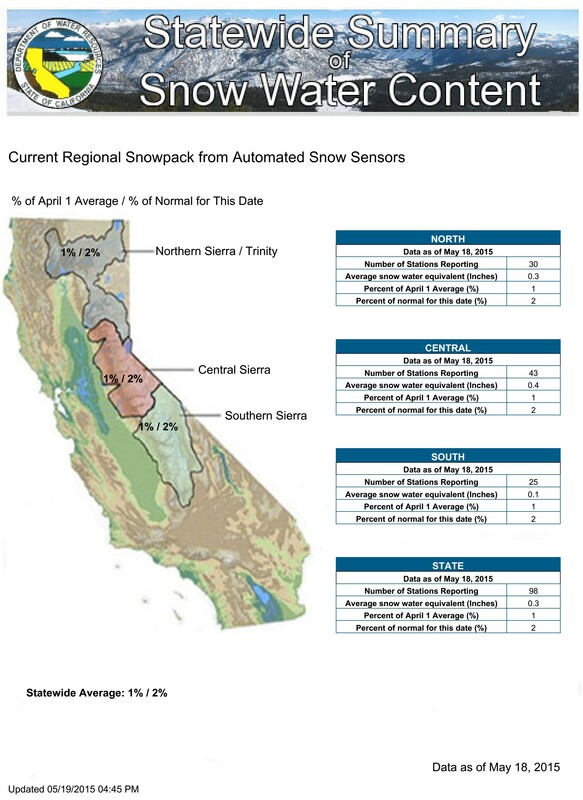 Here it is — the latest on the snow water content in the Sierra Nevada. If you are planning to backpack there this summer, you will want to keep a few things in mind. Stop at the Ranger Station — This is probably the best and easiest way to find out current water conditions. Rangers are constantly on the trails, in one area or another. They can tell you which areas to avoid and which areas have water, but are not as heavily traveled. Stay high — in elevation, that is. 10,000 feet seems to be a breaking point above which there is generally more water on a perennial basis, even in the late summer and early fall. If you are below that elevation, there will still be some water, but it will not be as easy to find as it is in “normal” snow/rain years. Think Arizona Monsoon — What? A monsoon in Arizona? Yep, that atmospheric moisture that backs up from the Gulf of Mexico, as far west and north as the California deserts and mountains. It usually shows up around July or August. It may not be good to have to pray for rain when planning a backpacking trip, but there may be more surface runoff available for capture during the monsoon, albeit sporadically in the afternoon/evening. So, it may actually be better to backpack this year later in the summer as opposed to earlier. Wild guess. Contingency plans are a must — Nobody is actually able to predict where and when water will be abundant in the Sierra this year since nobody alive has seen conditions this dry. There may be enough water to go anywhere; or you may have to hike extra far and high to find water. On each day, think ahead of time about how you can find water if your number one campsite pick is dry but you only find out when you arrive. Take a layover day, with a scramble to that tucked away alpine lake? Carry extra water bottles (ouch!)? Do only dry washing of cooking/eating items? This year, Mammoth Mountain, due east of Yosemite, reported only 2.6″ of snowfall in January this year. In contrast, they have already reported an unusually high 24″ in May, but it seems it is mostly melting as soon as it lands, except at the higher elevations. It is just too late for any snow to accumulate in a meaningful way. Overall, this is one of the driest years recorded at Mammoth. 1976/77 was the driest year there. Further, keep in mind that the snow survey at the Phillips snow course revealed no measurable snow at that location. That is the first time that has ever happened. So, it is going to be dry. Check out the official Department of Water Resources report/map below. Only 2% of normal for May 18? That is dry. And, it is the same throughout the Sierra. So, heading further north will not necessarily get you plentiful water. You can look back here at the end of August. We have a trek planned in the middle of August. I’ll report findings upon our return. In the meantime, keep on hiking!